My whole life a pancake was a pancake. There might have been other pancake-like objects, like crepes, but they most definitely were not pancakes. As I’ve traveled though, it is clear that the definition of “pancake” is regional and American pancakes are their own, special thing. They are also very delicious and something of a novelty over here in Europe. Generally in Europe a pancake is very thin and large in diameter. In Ireland they are served up one at a time by sprinkling lemon juice and sugar on them and rolling them up. Here in Denmark they are totally a dessert and never for breakfast. Then again, the dessert/breakfast line is verrrry fuzzy for me and Americans tend to have a lot more sugary sweet for breakfast generally. But I digress. The main point here is that American pancakes are fluffy, eaten stacked, and are most definitely a classic breakfast. They also seem hard for people to master who haven’t been exposed to them their whole lives. I have a number of Danish friends who are quite frustrated but determined to make American pancakes. This weekend friends cooked a kicking yummy dinner, so I took on breakfast the next morning and served up the elusive American pancake (with butter and maple syrup). I have a recipe that I carry in my head, and while probably not the best pancake recipe ever, it is the one I love because it is very easy for me to memorize because the ingredient measurements are a series of ones (in US measurements). As long as I can grab the ingredients (or equivalents) I can make these anywhere. I can also play a little fast and loose on the details sometimes since I don’t always have US measures or exactly what I need. I’ve made it enough that I have a good feel for what the final batter should look and taste like so I just sort of get there. The hardest part for me tends to be getting familiar with the stove I’m using so that the pan is at the right temperature. This is especially true of electric stoves, which I detest, but frankly they are very common, so if you travel a lot get used to it and stop your bitching. Makes 2 servings, or about 4-6 pancakes depending on size. Combine the dry ingredients (flour through salt) in a bowl. Whisk up the egg in another bowl, add the milk and stir it up. Now, add the egg/milk to the dry and stir. You want the batter mixed, without big pockets of flour, but don’t keep stirring until every lump is gone. A bunch of small lumps are fine and you don’t want to stir out all of the lovely bubble action which will start up. The batter should also not be runny. This recipe tends to make a thick batter and I often add a little bit more milk to it, but when you spoon the batter onto the pan it shouldn’t spread all over the place. You should need to nudge the batter out a little with your spoon. You can let it sit for a few minutes while you heat up your frying pan to a medium temperature. Add a little oil to the pan and when it starts to get hot, add a tiny bit of batter to test it out. This is where you just have to make them and get a feel for it. Once is it hot enough scoop some batter onto the pan to give you a 4-6 inch pancake (10-15cm). It should take only a few minutes for bubbles to start cooking through. Turn the pancake when you have a bubbly top and the edges are looking set. When you flip, it should puff up a bit. Leave it alone until it is done cooking. If you poke at it with the spatula or move them around you’re going to smoosh fluff. Let them cook a few minutes until the edges are cooked. If you are making a bunch, you can heat an oven on low and toss the pancakes in there to keep warm until you are done. 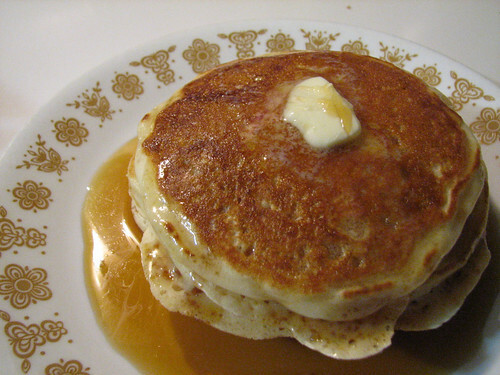 To serve, stack 2 or 3 pancakes with a little pat of butter between each (yes, I love butter) and one pat on top. Add syrup and consume with glee. I also often eat pancakes with a quick mix of chopped fresh fruit stirred up with some honey or sugar, or you can use jam. Next postIs Copenhagen really that expensive?